I think our fourteen-month-old cubs have hit the bear equivalent of the teenage years. Attitudes change faster than you can say “boo”, and there is a general flexing of physical and mental muscles. With no bear is this more apparent than with Berbere, who seems to be in love. He was assigned to my care in October when he was only 19lbs of nervous, tiny bear. Over the last few weeks he has morphed from Mr. Shy-and-Terrified into still tiny, but very outgoing Mr. Loverboy. He is like a bear transformed. And it seems to be mostly due to one other cub. 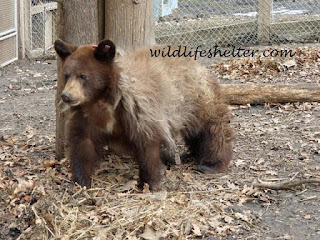 We recently moved Mimosa, the bear who taught me to see the beauty in a bluff charge, into the enclosure Berbere shares with twelve cubs who are spending the winter gaining weight instead of hibernating. Was it Mimosa’s pretty face or her self-possessed manner? Something about her set something about Berbere in motion – literally. Awkward little Berbere, who is not the most athletic of bears, suddenly enjoys sprinting through the enclosure and performing flying leaps onto logs (not always successfully – sometimes he misses and falls to the ground). Hugging the climbing tree to his chest, he’ll shinny up as fast and high as he can, then throw back his head to check if Mimosa has noticed him. She usually has, but judging by her bewildered stare not necessarily in a positive way. So far, Berbere is undeterred by this lack of results. His walk has turned into a swagger, and he keeps approaching Mimosa, who is neither amused nor pleased by this. And yet he can’t stop himself. He’s constantly peeking at her from behind tree trunks, dangling his paw at her from above, and inching as closely to her as he dares – to no avail. Considering that Berbere spent his first three months at Northern Lights Wildlife Shelter mostly in the safety of his den box, this is huge. Getting him to leave the box for cleaning used to be a major undertaking. He stayed in quarantine an extra month so he could gain more weight without having to compete with the other bears for food, and when we moved him into an enclosure closer to the other cubs, he took root in the new den box with a vengeance. He did not dare explore his new surroundings for weeks. I just about despaired. How would he ever survive in the wild if he couldn’t find the courage to leave what he considers his safe spot? He sniffed the bears from the distant safety of his box, he dragged food into the safety of his box, he did not want to spend any time away from it. He thought this was all he had. If he hadn’t been orphaned, his mother would still be providing the security he craved. 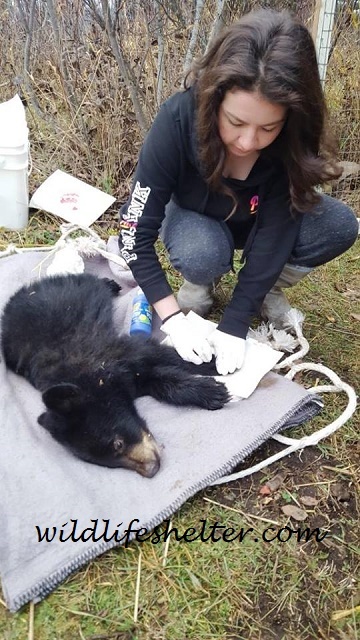 I guess this is one of the difficulties all orphaned wildlife in rehab face: the animals can’t rely on their mother anymore, and have to somehow find the strength within themselves to feel safe, at an earlier age than they would naturally be challenged to do this. But somehow, Berbere succeeded. 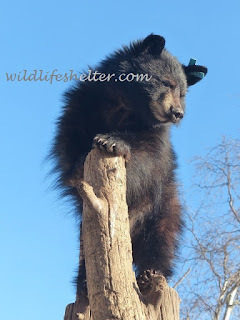 At long last we began to see him a couple of metres away from his den, awkwardly clambering around on the climbing structure, and eventually checking out the larger part of the enclosure and the other bears as well. As he discovered that nothing bad happened, he began to trust himself more and more. It feels like with this latest leap of faith in himself, wooing Mimosa to become his friend, he is finally growing into his real character. I am so lucky to witness this.